When Magda invited me to be part of The House of Estrela Refashion Month, I didn't hesitate. A whole month of refashioning with 20+ guest bloggers... count me in!!! Not so long ago, I acquired a pair of hand me down, girls' jeans, too large for now, but I thought they would be perfect for next year. Unfortunately, the little recipient disagreed... I cannot wear those. They are not for girls. They are boys' pants!!! Pointing out the lace on the pockets made no difference. And I'm afraid I had to agree; they were rather plain and boring. 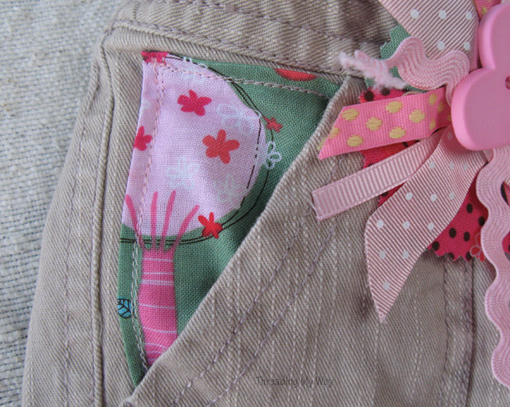 I had seen lots of jeans refashioned to skirts, so thought I'd make these pants more girlie by doing just that. Initially, I tried to leave the side / front pockets on, but it just didn't look right. You can see from the photo above, that I also mis-measured and cut the sides longer than the middle front / back. And that's the beauty of refashioning... you can make it up as you go along. There are no rules and you are limited only by your imagination. 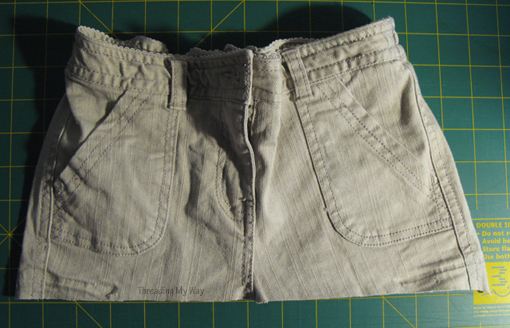 The pockets were taken off and the bottom edge straightened up. All of the jeans skirts I'd seen had gathers, so I thought I'd try pleats instead; 3 on each side for the back and the same for the front. Most girls go through a pink stage, at some time or another, so one obvious way to make a garment more girlie, is to add pink. Too much wouldn't work with the bone colour of the jeans, so I chose the tree print, which I had inherited from my daughter when she was de-stashing. All the buttons were replaced with pink ones (as you can see from the back view in the photo above) and some pink ric rac was added. 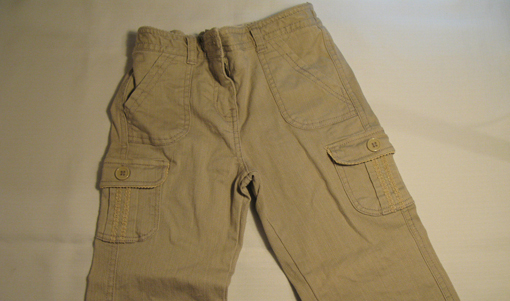 Colour was added to the pockets by hemming a square and attaching it to the jeans at the top and one side. 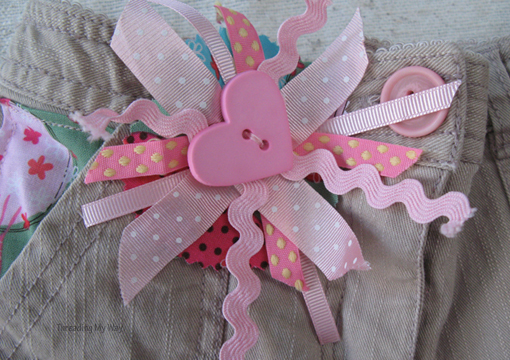 Just in case the new jeans skirt wasn't girlie or pink enough, I made a scrappy fabric flower, with ric rac, ribbons and a cute heart shaped button I received in the Crafty Cooks Apron Swap. I've attached it to a hair clip, so it's removable. If you look at the fabric near the zip, it appears bunched up and it is. It was like this before I cut into the jeans and I'm not sure how this is going to make the skirt sit when it's worn. If I pull out the fabric near the zip so it is flat, the front of the skirt rises a little. Perhaps I should have cut the front a little longer than I did. We'll see next year when the skirt fits. I can always make a belt if the waist is too large. 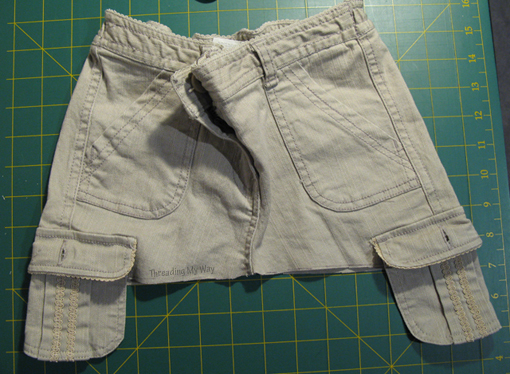 There you have it... a pair of plain girls' jeans refashioned into a skirt for a little girl. Hopefully she'll approve of the changes I've made. For more refashioning ideas, head on over to The House of Estrela Refashion Month. 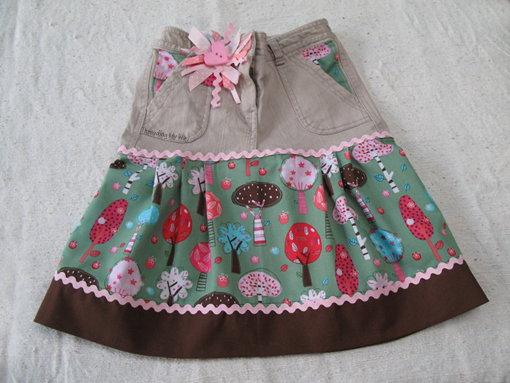 Beautiful skirt! I love the tree fabric. This is really cute, and I'm pinning it! It looks fantastic. 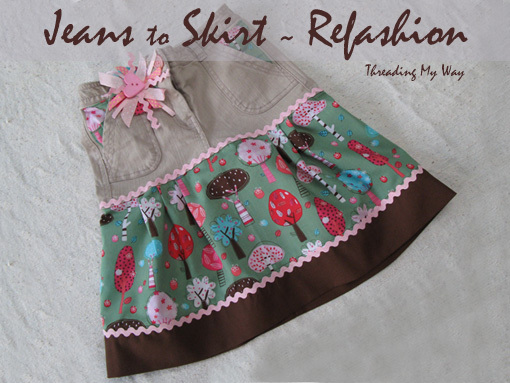 My Miss 4 would love to wear it - after your refashion! Love the skirt Pam. 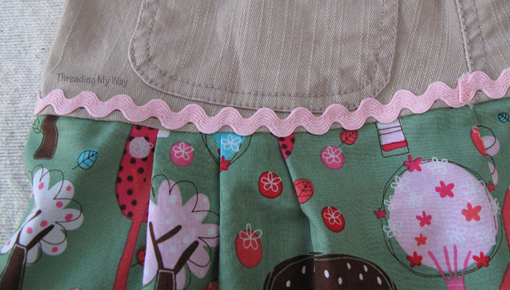 I just noticed the pleats on the skirt - love them! Pam this is Marvelous!!! and as i wrote to you personally,last week i was just working on making a summer dress from an old [30+years] 2 tiered skirt. I used only the lower tier, thus the upper one is still to be used as well . Love the pleats and your fabric choice. It's certainly girly enough now! Darling! I love the ric-rac and the scrappy fabric flower. :) Great job using the pants to make a suitably girly piece of clothing! Gorgeous skirt Pam! Definitely should be girly enough now. I can see why you wanted to leave on those side pockets - I would have tried that too! Refashions always change as they go though I find! This one turned out beautifully! That's just downright adorable. enJOYed your inspiring post. I look forward to seeing your retake on this, Gina. Great refashion, Pam! Such a fabulous fabric! thanks for sharing! What a great idea and what cute fabrics! Thanks for sharing. oh how sweet! Unfortunately I only have 2 pairs of jeans that fit me so can't make one... unless I buy more jeans! 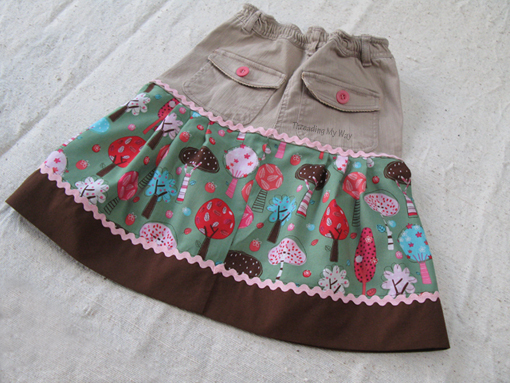 That is such a cute skirt refasion I love the lighter colour pants at the top too fab! !